…are too good not to share. An example of this is the lamb kefthedes I made for dinner last week, which came out to be the best meatballs I’ve ever eaten, bar none. Wait… those Sardinian meatballs are pretty fantastic too, but in a very different, soft and saucy way. The photo doesn’t do them justice: They were perfect fresh from the skillet (crisp and golden outside and succulently moist inside with a touch of pink), tasted just as good at room temperature, and held up admirably in the form of reheated leftovers, warmed in a 350F oven for 15-20 minutes. 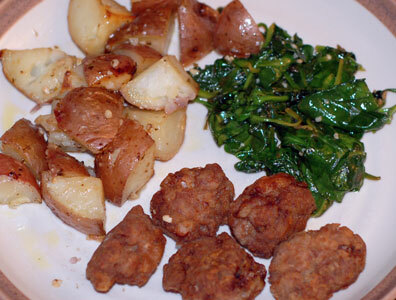 I served them with a mound of sauteed spinach and Greek roasted potatoes (which also reheated nicely in the oven). A few more specific notes: There was no mint in the house, so I didn’t use any, and we didn’t miss it. I used my “coarse” microplane paddle, and the (unpeeled) potato came out closer to pureed, so I didn’t use as much as called for. I also started out with one slice of bread and added a second once I saw how much liquid the potato added to the mix. Playing it by ear can be a good thing. Dip the bread in water briefly, then squeeze out the excess and crumble it. Mix together with the remaining ingredients, lamb through onion, working with your hands. All the ingredients should be well combined and equally distributed, but do not overwork the meat. Leave mixture to rest for an hour or more in the fridge, to allow flavors to meld. To form, spread out the flour on a large plate; have a second, clean plate ready. Take a tablespoonful at a time of the meat mixture and form into a small ball, about 1 1/2 inches in diameter. Roll in the flour and shake in the palm of your hand to remove the excess flour. Place the dredged meatball on the clean plate. Continue with the remaining mixture until all the meatballs are shaped. To fry, heat about 1/2-inch of canola or extra-virgin olive oil in a 12″ cast-iron skillet over medium heat. Using a tablespoon or small spatula, gently place as many meatballs as will fit in the pan without crowding. Fry them, turning once or twice so that all sides are nicely browned. Remove, drain slightly on paper towels, and serve, either hot or at room temperature. The meatballs will be crunchy on the outside, and velvety smooth on the inside. Preheat oven to 400°F. Place the potatoes in a single layer in a 13-x-9-inch baking dish and pour the oil over them. Add the garlic, dried oregano, salt and pepper to taste and toss well to coat with the oil. Bake the potatoes for 15 minutes. Add the stock, toss and bake for 10 minutes more. Add the lemon juice, toss and bake for 15 to 30 minutes more, or until the potatoes are cooked through. If you like, preheat the broiler and broil the potatoes for 2 to 3 minutes, or until golden brown. Sprinkle with the fresh oregano and serve at once. Makes 4 to 6 servings. Variation: Dissolve 1 tablespoon tomato paste in the stock, and reduce the amount of lemon juice to taste. Substitute Aleppo pepper or crushed red pepper flakes for the black pepper.